What happens in the daily life of the family.. the drama of foster care, the adventures of parenting, & pictures to share with everyone! I feel like we are just spinning our wheels… Life is flying by. We are so busy. But, so much of it just ends up being “busy” not things that are adding to our lives. I actually had more time off this week than I have in a *really* long time! And it was really nice. But, I don’t know if I took advantage. I don’t know if I used my time wisely. I don’t know. I also have been having good days here & there as far as my mental health. I feel like I have had a few really good days. But, I also feel like I am still right on the edge. One comment here or there can unravel my entire day. Sometimes it’s even just a thought that sends me spinning. I plan on going to my doctor soon… I think it’s time to adjust my medications. I also need to get back to working out. There are so many excuses for me not to, but I know it helps. I have not gone to the gym, but I did run yesterday. I honest to God, ran! I haven’t gone faster than a walk in ages. I didn’t run straight through or anything, but I did push myself. Without going into detail, V’s working his way out of the trouble he got himself into. It’s hard though. He’s still a 12 year old. He still grumbles about work. He still tries to talk to everyone at school. And, when you are in *big* trouble, all of the little stuff is more noticeable. My struggle is knowing how hard to be on him for the little stuff. D is back to work… He returned to his old job. He is such a hard worker, but couldn’t get any interviews when he was looking elsewhere. And my little D is doing well. 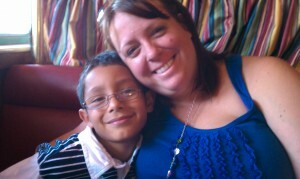 He was on honor roll last quarter and has a nice new girlfriend. He is learning quickly about how expensive things are.. and he, too, has been looking for a job, but has also had no luck. My little beanie is doing well. She is a little behind in school. She has always been a little behind academically. We are asking, once again, for the school to test her for any learning disabilities. She wasn’t behind enough to warrant testing in the past. And that’s rough. Do we really need to wait for our kids to fail before we find out if we can help them? Anyhow, she has started Kumon, too. She isn’t a big fan, but, as always, she does her best. B is working. All.the.time! Thankfully, there’s not travel for a couple weekends. Me? Well, I don’t know. I think I am back to “normal” (whatever that means). I am still pretty high stress and the littlest thing can cause a panic attack. But, there aren’t daily tears. And I am able to get what needs to be done done. I have also gotten out and walked quite a bit lately. I still haven’t made a return to the gym. And I need to. I know that working out will help, but it also takes time & effort & energy. And, those have been in short supply lately. Hey party people! I have been rocking at the gym. I have made it to the gym at least four times a week since the year started! And I have peppered a few runs in the middle as well. 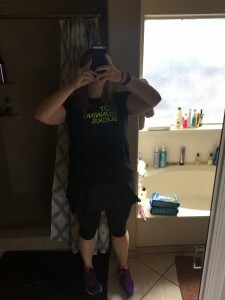 Saturday I run my next half marathon.. Trying to decide what I should wear. And, now I am an ambassador for Skirt Sports. So, I have a couple new, adorable skirts to pick from. And, if you need your own skirt to love, I have a discount code for you! Hit me up! I am sure everyone who really *knows* me already knows that. But, I am asking you.. The great masses (as if anyone reads this! ), please, know that I am fighting. And I would love you to have my back. I have really been having a rough go as far as my diet since about October. I am someone who is going to be battling food addiction and my weight and my diet for my entire life. But, lately it’s been bad. Tomorrow, I am heading to the gym to get weighed and measured and get a diet plan. And I would love some support. Check in on me, call me out on the junk I am eating, let me know I am not alone. I need to make the choice again to be good to myself, but being bad feels so good. So, please, help! As in defeated. They do dole out some harsh physical punishment, but no actual beatings. However, today, I was beaten. I have been dealing with a strain of my achilles’ tendon. I don’t think it’s even a partial tear (the only way to really know is an MRI that I will not be paying for). But, it did hurt and it has kept me from running. On my drive to the gym this morning I really wanted to turn back around and go home. I was already sore all over from the previous days, I was (am!) tired. I just didn’t want to do the gym. But, I didn’t turn around. In fact, I decided that I would try to run! And I did. I ran the first few little laps as part of our warm up, until I tried to skip and my heel informed me that there would be *no* skipping. The gym has been good about modifying and working around this pesky injury of mine, but it’s meant that pretty much all of my cardio has been on the elliptical trainer or the bike. I don’t like those machines anymore. I just want to run! I was stewing in those thoughts as I watched everyone else warm up. Then, in our first cycle of exercises I was supposed to do a pull up.. Thankfully, they had some support if we weren’t strong enough to do a pull up (spoiler, I am not!). But, I wasn’t even with the support. I spent the first minute just trying to figure out how to use the help. The second round was pretty much the same. The third I just struggled… And then, my body truly betrayed me. I started tearing up. I cry during runs. Usually if I make it farther than 9 miles, there will be tears. But, I am in my own world then. I am not in a gym with hip hop blaring surrounded by other people who *can* do a pull up. I am not frustrated by injury. I was so very tempted to go to the bathroom and have a good cry. I was half tempted to just grab my keys and leave forever. But, I did neither. I sucked it up, wiped my eyes and kept going. I don’t know that there was really a victory. I am sitting here with tears in my eyes as I replay the morning. And I know it will be very, very hard to go back tomorrow. The sprint triathlon was yesterday morning. With all of my races, I get nervous and can’t sleep. But, usually I am really excited, too. This time around, I honestly wasn’t. I was just freaked out. Danny was doing it with me and he admitted to being a little nervous (huge for my 13 year old boy to do that!). So, I was trying to keep it in check (and probably failing). Friday night we laid out our stuff the way that we envisioned it for the race the next morning and practiced putting our shoes on. It felt silly! And, since nothing looked quite the same at the actual race, it probably was. But, I think it did help my nerves. We got up around 5:00 in the morning.. My neighbor, the one who thought up this whole thing, loaded up our bikes into his truck and we were watching the sunrise as we drove to the race. This entire thing was so new and foreign to me! We racked our bikes and laid out our gear for the transitions, but there was hardly any space. When Danny dropped his bike at the second transition he wasn’t even able to put it back. For this swim, we were doing a serpentine of the pool, it was 8 x 50m laps. And they didn’t let you dive… you jumped in, one at a time, every 5 seconds roughly by pace. I knew this ahead of time, but it was so hard to envision! Dan started before me and his swim looked great. I have no clue how he did it without goggles (even with goggles I got jostled by other swimmers! ), but he started ahead of me and gained ground. When I jumped in, I a managed to inhale a ton of water. I spent most of the first lap trying to avoid choking and drowning. It was ugly! And my swim really didn’t get any better. I couldn’t get a rhythm, I kept getting trapped behind 2 slower swimmers at a time. I had a hard time breathing. But, I will say that it didn’t wear me out! I had more laps in me. I could have gone farther/faster had I not started out in such a poor way. So, live and learn for next time. When I made it to the first transition Dan was still there. He was a little slow getting into his running gear so we left on bikes together. We took off on the bikes and I actually felt pretty good. I kept up a decent pace, nothing crazy, but it was ok. I kept waiting on Dan to pass me. He never did. Later on, I learned that his shoe lace had come undone and been caught in his chain. His chain even popped off and he took a spill. 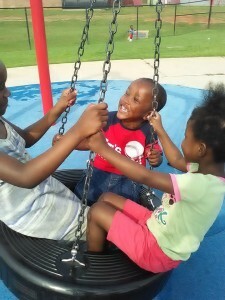 While I was worrying about him, I kept telling myself that *someone* would help my baby. I told myself that if he were hurt they would call. If he broke down, he would get back to the transition point and someone would call. Turns out, he was on his own, but he handled it like a champ. It just took a huge bite into his time. I was even more worried when I didn’t see his bike at the second transition, but since I was jogging, I sent a text to Brian. Knowing that both of us were looking made me feel a tiny bit better. The run was ok.. It wasn’t fast or really slow for me. My GPS was off so I have no clue of my actual pacing or time, but I got it done and felt great at the end. Brian and the other kids came out to cheer and I totally teared up when I saw them. Their high 5’s gave me the boost to sprint to the end. Danny finished within a couple minutes of me. So very proud of that boy! He came in 11th in his age group! He told me he’s not super excited to do it again, but he also admitted that what he really didn’t like was waking up at 5:00. So, the second I find a race around the crack of noon, he’s all in. I probably should just wait at this point to post anything.. But, I have a few minutes so I will sneak in an update. A couple months ago we had a few friends over and my neighbor brought up a sprint triathlon. I am going to go ahead and blame the beer! I had a few so I thought that a triathlon sounded like a great idea. Fast forward to now, and I think that I have a trained enough (enough to finish, although it won’t be quick or easy!). But, I am really not very excited. I am just nervous. I have tossed and turned a lot this week. As soon as I lay still my brain starts going through all of the steps I will need to follow and all of the gear I need to prep and pack. Thanks to an amazing neighbor I have better gear than I could afford. And I know that I will be fine. But, I am still scared. I will let you know if I survive. Today is a special day. It’s not a birthday or an anniversary, but it is special none the less. 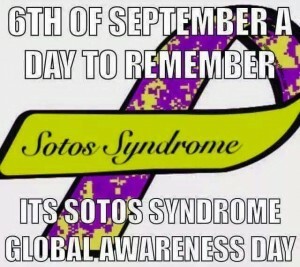 September 6th is National Sotos Syndrome Awareness Day! 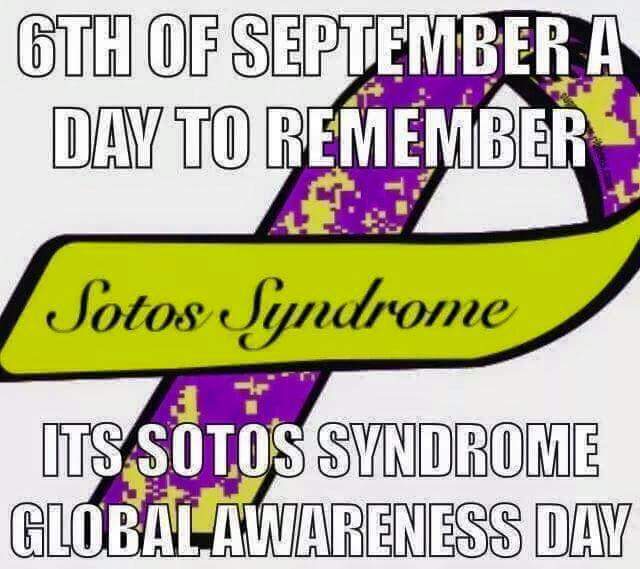 “Sotos syndrome is a genetic condition causing physical overgrowth during the first years of life. Children with Sotos syndrome are often taller, heavier, and have larger heads than their peers. Because of the distinctive head shape and size, Sotos syndrome is sometimes called cerebral gigantism. Ironically, this rapid physical development is often accompanied by delayed motor, cognitive and social development. Muscle tone is low, and speech is markedly impaired.” You can read more here. And why is Sotos Syndrome important to me? Well, I happen to care a lot about a little guy who has Sotos Syndrome. I am a member of a group Who I Run 4. The group is full of thousands of runners and special needs kids and adults. They randomly pair up the runners with the kids and adults. I waited over six months to be paired with my buddy! Now, when I run I think about him.. I think about the challenges he faces and has already overcome in his young life. And, when I get medals, I send them to him! The group has all sorts of members.. Some runners are just beginning, others are very fast! 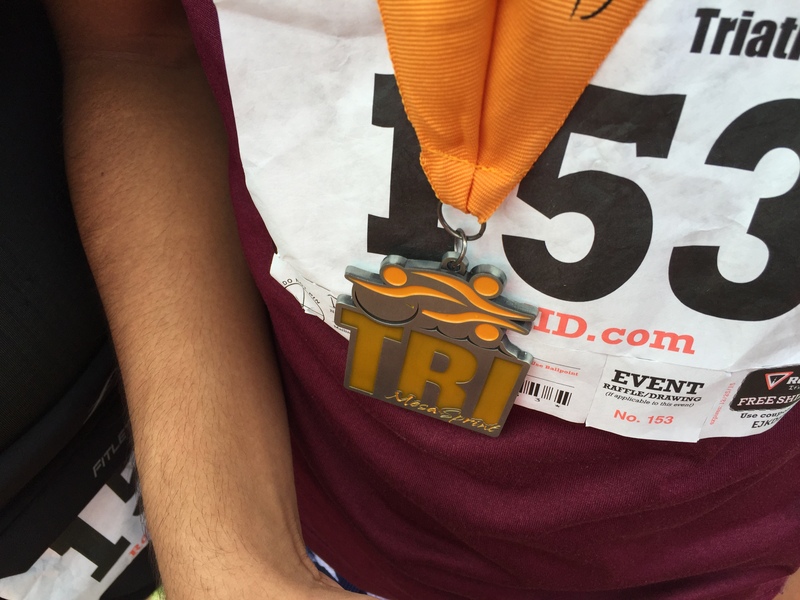 Some only run for fun, others spend each weekend winning local races. And the buddies are amazing! There are infants all the way through adults. It’s really just a chance to make a connection. To get to know someone and cheer them on. The runners push the buddies and the buddies push the runners. It’s pretty freaking cool. Speaking of cool.. This is my buddy! He just turned three a couple weeks ago. He lives across the country from me in Florida, but he pushes me as I run. He also recently started *walking*! The video his mom posted brought me to tears. And isn’t that smile amazing? So, I hope that this makes you think a little bit about Sotos Syndrome. And I hope that you will keep my little buddy in your thoughts this week. Maybe you could even run a mile for him, too? 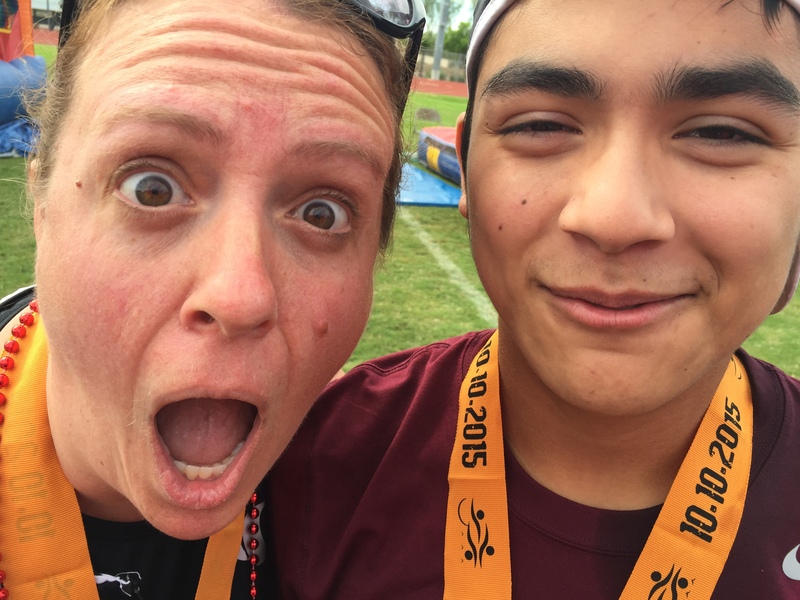 One last thought… The Who I Run 4 group is amazing! But, it also has a massive waiting list! There’s no wait if you are a buddy, but if you are a runner you can expect to wait at least 6 months (worth it!). I would love to see more buddies learn about this organization. 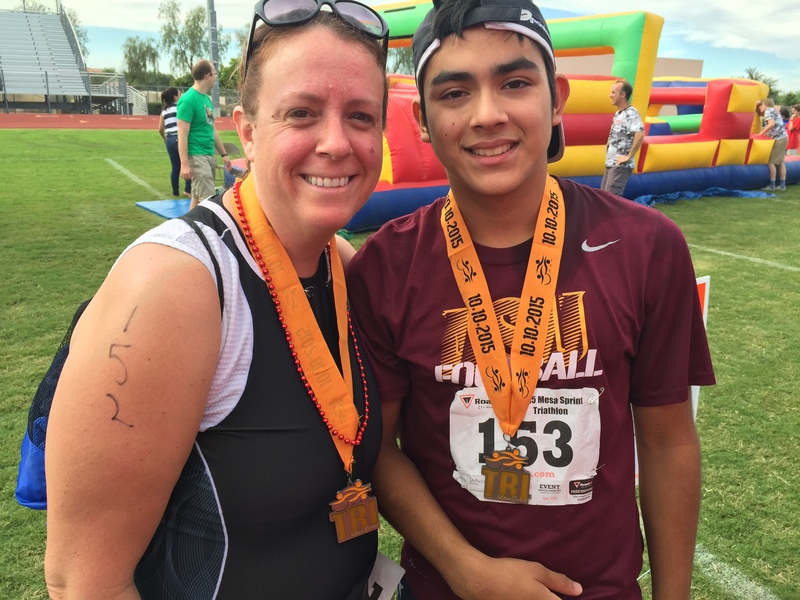 So, if you know someone who could use a runner in their corner, please spread the word. Once again (or maybe it’s an all the time thing now?) 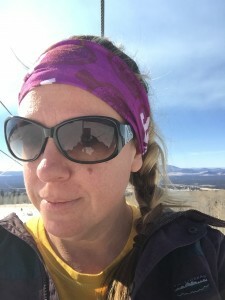 I am struggling… I am fighting depression and my addiction (food). And, while I own the fact that I am the one with the power to fight and I am the one with the issues, I also started thinking about PCOS. And the role that PCOS has in all of this mess. And I got angry. I hate PCOS. If you don’t know PCOS, or even if you do, you may not realize how much of my life has been impacted by this stupid syndrome. Here are the top 10 things I hate about PCOS. 10. The treatment options… Birth control pills are really the only things that can help with PCOS. And many of them make me even more insane! 9. Those treatments above? Well, they *only* treat your cycle. They do nothing with the other horrible things that PCOS causes… What are those? Well, keep reading! 8. The acne. I still have acne. It was horrific when I was younger, and has gotten better. But, I never am completely acne free. 7. The hair! I won’t go into too many details, but it’s embarrassing! I wax my chin and my upper lip. It’s expensive and annoying and never gone. Every time I look in a mirror I get some little wispy reminders of the PCOS that has taken over so much of my life. 6. The weight gain. 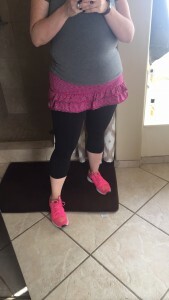 PCOS means that losing weight is harder for me. Gaining it? Really stinking easy! 5. The depression. PCOS can cause depression. 4. The menstrual cycles… I could go on BCP (and likely kill a family member). So, I battle my cycles. Sometimes they come every other week, sometimes every few months… Sometimes they last three to four weeks. I am not over exaggerating or stretching the truth. This is my “normal” and it’s been like this since I was 12. 3. The other pesky side effects that loom in the distance for me. Women with PCOS have a higher risk for heart disease and diabetes. 1. All of this combined… PCOS has taken over my life. I never viewed it as a big deal. And many days I can just forget about it. But, the truth is that it has shattered my dreams. I wanted to be a mom for my entire life. I am a mom, but I still mourn the loss of my fertility. Even though I am a mom, I am not the best mom that I could be. I spend a lot of my life fighting these issues listed above. That’s time and energy that I could be using on my marriage and my children and my life. Instead I fight the stupid battles against depression and carbs. I typed up the rest of this and was thinking about it on a walk this morning and one last thought occurred to me… Sadly, I am actually a lucky one. There are many women out there who are fighting all of the above, but don’t even know the name of their enemy. PCOS is also often undiagnosed. I consider myself lucky to have had doctors who put the pieces together when I was still in high school. But, if you are interested in learning more (or seeing if I am making this up), here are a few places you can learn more. 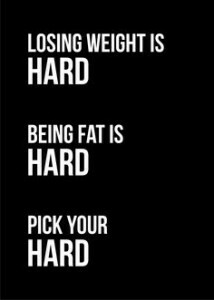 One of my favorite little weight loss sayings.. I am one of the ones who has failed. I have failed over and over and over again. I think/hope that it’s pretty obvious in just my face.